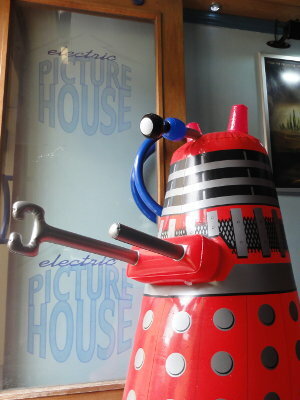 One of the most dreaded creatures in the known universe was menacing visitors to the Electric Picture House in Wotton lately - and threatening anyone who talked during the film with extermination. 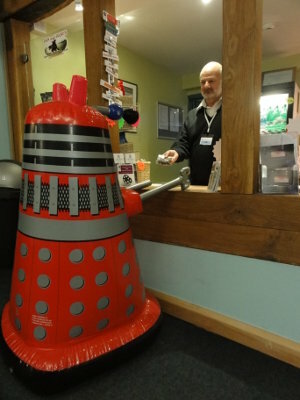 The four foot inflatable Dalek was visiting to promote the cinema's forthcoming screenings of the classic 1965 film, Dr Who and the Daleks (U). The film, one of two starring Peter Cushing as Doctor Who, has been digitally remastered and re-released in cinemas, marking both the 50th anniversary of the TV series, and the centenary of Cushing's birth. The film can be seen at the Wotton cinema on Saturday 18 and Sunday 19 May at 2pm. Dr Who and the Daleks sees Dr Who travel through space and time in the Tardis to find himself on Skaro, the birthplace of his arch-nemeses, the Daleks! On a planet devastated by nuclear fallout, the hideously mutated Daleks have to live in metal suits to survive, while plotting the destruction of the planet’s other life-form, the Thals, with a massive neutron bomb. The gentle Thals are doomed to extermination- unless the Doctor and his friends can save them! The Dalek was provided courtesy of the North Somerset Modellers' Society. Tickets for the film cost £5.50, and can be booked in advance at www.wottoneph.co.uk.